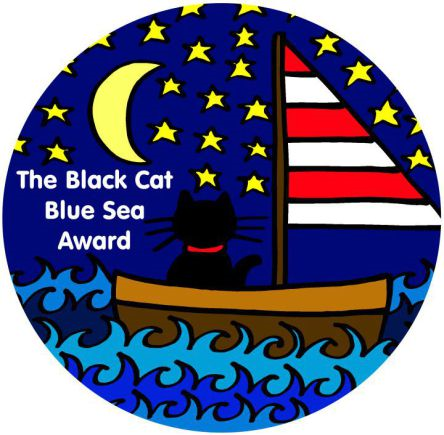 As you know from my previous post, Stephanie over at Making Time For Me nominated me for the Black Cat Blue Sea Award. I am honored to accept. “Anybody nominated, can nominate seven (lucky number) other bloggers. Anybody nominated answers three questions. The questions you ask while nominating can be any three questions. If any of the questions asked are offending or simply do not want to be answered, the nominee does not have to answer them to earn the award. Who was the first blog / blogger you heard of / read and did they inspire you to start? This one is easy. I never heard of blogging until my Cordelia started her blog, Cordelia Calls It Quits, and then she encouraged me to write posts for her site. I had my own sub-blog entitled Cordelia’s Mom Is Still Hanging In There. Subsequently, I decide to spin off and start my own blog. And the rest, as they say, is history. Do you see Blogging as a future career or just a side hobby? Like pretty much every other blogger, I would LOVE to have blogging turn into a future career. Alas, it doesn’t look like that’s going to happen any time soon, so I guess I’ll just keep enjoying it as a side hobby. However, that does not mean that I won’t keep hoping to be discovered by one of the major publishing houses and asked to write the next block-buster novel. What is your all time favorite Album and Why?, How does it make you feel to listen to it? This one is tough, because I’m really not a music person. I only listen to CDs in my car (that’s right -CD’s, I don’t even use an iPod!). Depending on my mood, I listen to Neil Diamond, Simon & Garfunkel, classic or jazz. If I’m in a playful mood, I listen to 1980s funky music – and if I’m feeling a little dark, I listen to Trans-Siberian Orchestra’s Beethoven’s Last Night. And, of course, at Christmas time, it’s Trans-Siberian Orchestra all the way. This entry was posted in Awards, That's Life and tagged Black Cat Blue Sea Award, blogging, Cordelia's Mom. Bookmark the permalink. Wow, that’s a new one, thank you so much for the mention! Do they still play Neil Diamond on the radio? I never listen to the radio, except for local traffic information during the morning and evening commute. That’s why I had so much trouble with that question – I couldn’t even tell you who any of the modern performers are! They do on classic rock stations, yes. I do know current artists, but I like very few of them. Yours would be a blog buster novel..someday. Looks like there’s some interesting new blogs to explore. Thanks! You’re too kind. Actually, I’m thinking about some kind of collaborated blogger novel – if I get brave enough to float the idea. Congratulations 🙂 If you should figure out how to earn money blogging, please tell me too!! For sure, Marilyn. When it happens, we can do it together. Congrats on the deserved award! Thanks, Megs! I actually thought about transferring my CDs to MP3, but figured it would be just too much work. I’ll probably have to, though, once they stop putting CD players in cars – some auto makers have already discontinued them! Sorry, Megs, but I have a co-worker who recently bought a Jeep Cherokee, and she was very disappointed that it only had an MP3 player. She had to go out and buy an iPod, and then transfer all her CDs, in order to listen to her music in the car. I am so not ready for that!